Across 7 chapters, including big plates, small plates, salads, sweets, dressings and drinks, Smith & Daughters offers 80+ delicious vegan recipes with a Spanish twist to recreate at home. From `chorizo' and potato, Spanish `meatballs' in a saffron almond sauce, chipotle cashew `cheese', `tuna' and green pea croquettes to warm Spanish doughnuts or spiced Mexican flan, the recipes give new inventive life to classics that will appeal to meat and vegetarian eaters alike. 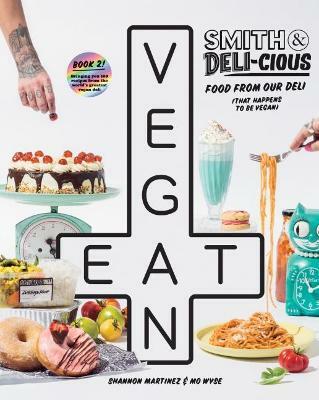 Buy Smith & Daughters: A Cookbook (That Happens to be Vegan) by Shannon Martinez from Australia's Online Independent Bookstore, Boomerang Books. Mo Wyse is a Seattle and NY expat. She studied journalism, has a background in production but dedicated her passion for creative, plant-based food to creating Smith & Daughters, where she is the logistical, front-of-house and marketing brains behind this gun team. Shannon Martinez has cooked since she can remember and due to the influence of her Spanish paternal family and her outside the square, innovative talents she's contributed to kitchens across Melbourne over the past nearly 20 years. Shannon eats meat, but has perfected her vegetarian - and latterly - vegan repertoire saying this is what makes her food so good; she tries to replicate the tastes and textures of meat, rather than putting out bland, predictable, vegan food. Smith & Daughters on Brunswick Street, Fitzroy began in 2014. Food lovers went nuts. Almost immediately, they had grown to 40 staff and were doing 400 covers a night. In July 2015, they opened Smith & Deli, in nearby Moor Street an all vegan convenience store and deli. The idea here is a carefully curated selection of all vegan groceries, and freshly made pastries, salads and take-home vegan meals. There are also 32 made-to-order sandwiches, "cheese" and "meat" by the kilo - and, often, queues out the door.